This was split from a thread on dotNET applications. Dl portable version @ http://rei.to/carotdav_en.html#download (untested). Only requires dotNET 2.0 and FWG just did a very positive write-up on them. I didn't look at this before because it doesn't support SFTP (which I use almost exclusively), but the ability to auto-split files to save things on services with file size limits is completely fantastic (SkyDrive has a 25 meg limit, I think Google Drive is 1 gig). I'm starting to use cloud services more frequently, so I'll definitely look into this. Finally got a chance to test with Dropbox, Google Drive, and SkyDrive. All seemed to work very well. Uses an authentication system via your browser rather than just entering the username and password. Works really well with one caveat: after uploading something, you have to refresh the folder set before you can delete the file (say if you uploaded something by accident). At least on the hashing alone, SkyDrive appears to have fairly high security. That said, although it doesn't store usernames or passwords in plaintext, and even supports a master password, I'd still put this program inside an encrypted volume like TrueCrypt. Will definitely add it to the database sometime soon. Really terrific program to unify all the different cloud storage services. 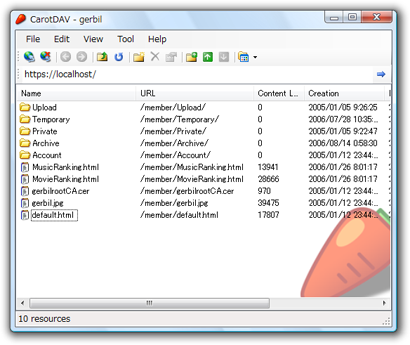 CarotDAV is an excellent program; the ability to log into multiple Box, Dropbox, etc.. accounts, FTP/FTPS, securely log via WebDAV, e.g. to HiDrive, various 'Authentication Methods', Resume - Upload/Download, Auto Split, Encrypt/Verify - File(name/contents, etc..), Master Password, it truly is a GEM! Creating a Master Password negates your 'Security note' / concern (which is kinda moot, as access is already established by running the program); all info regarding ALL accounts, i.e. account, username, password is encrypted on a single line in the XML 'Settings' file; with just 3 accounts, 2 Dropbox and 1 HiDrive, ~4400 cols. Info on Encryption method is stored in the XML file. True -- for most users, that's plenty secure. Thank you, webfork. Voted . Fixed an issue in which the Unauthorize authentication to succeed but in GoogleDrive. Supports site-to-site and copy, the copy to ShellNameSpace in DragDrop. Fixed some problems that had occurred in the DragDrop. Fixed a small problem other. When you create a folder or file upload, modify traffic generation so as to reduce the. It corresponds to v2 API GoogleDrive. It corresponds to .Net Framework 4.0. It corresponds to TLS1.1 / 1.2 accordingly. Fixed a problem that Public and Photo was no longer look at DropBox. Fixed connection was funny in SkyDrive. Modification of other finer points. It corresponds to the API change of Box.